There are affiliate links at the end of this post, at no extra cost to you upon purchase. I have had rugs on my mind. I would like 3 new rugs. One for the kitchen, one for the side of my bed, and a new one for the TV room. I look for deals, I look for colors, and I look for makeovers ideas. I look even when I don’t need a rug. I don’t know what that means psychologically, but I just like rugs. That is all there is to it. SO, I decided why not “Update Your Existing Rug with Interior Paint”. I bought this rug at Wal-Mart years ago for about $10. Steal of a Deal, right? These were my tools: A regular old paint brush, a stencil and paint. Yes, I used interior satin paint. I went to Wal-mart and had them color match “Summer Sonnet” by Ace Hardware. Now I could get started. I first traced along the lines that were already on the rug. Easy. I drew out a pattern on a piece of paper where I wanted each stencil to be placed. I tried really hard not to make each row the same. With my regular paint brush I dabbed the paint through the stencil. Seriously SO easy! As you Update Your Existing Rug with Interior Paint, it adds depth and dimension to a rather boring rug. Now I have a “NEW” rug. I can’t believe how nicely it turned out. Happy me. Happy new rug. Yay! 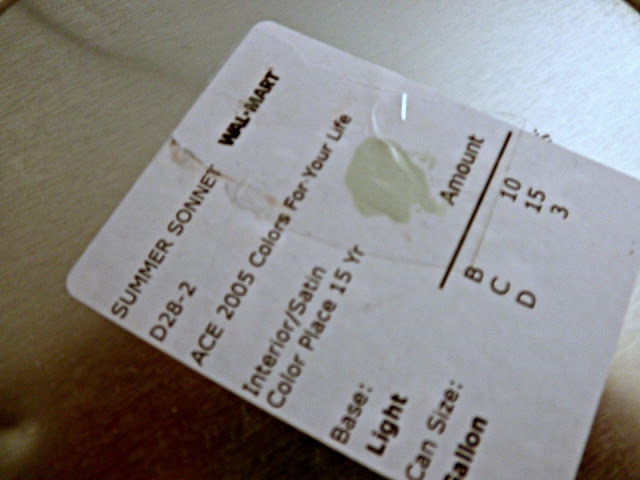 FYI-In case I ever need to clean up an oily food spot, I used a wet sponge with Dawn soap over the paint. The paint remained in tact. The painted areas are a tiny bit stiff, but not unbearable or uncomfortable with bare feet. I have also vacuumed the rug and no damage was done to the paint. 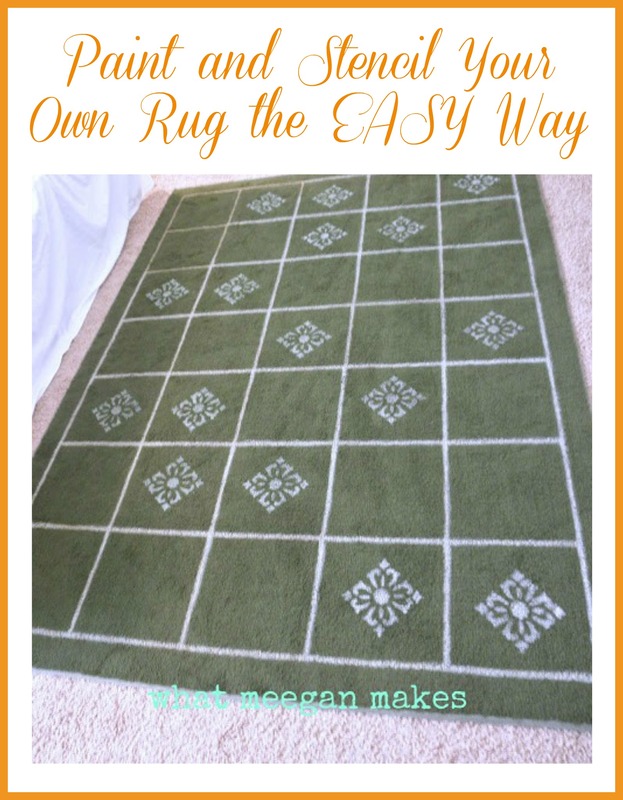 This idea is fun, creative and inexpensive in comparison as to how much rugs cost. Believe me-I know. 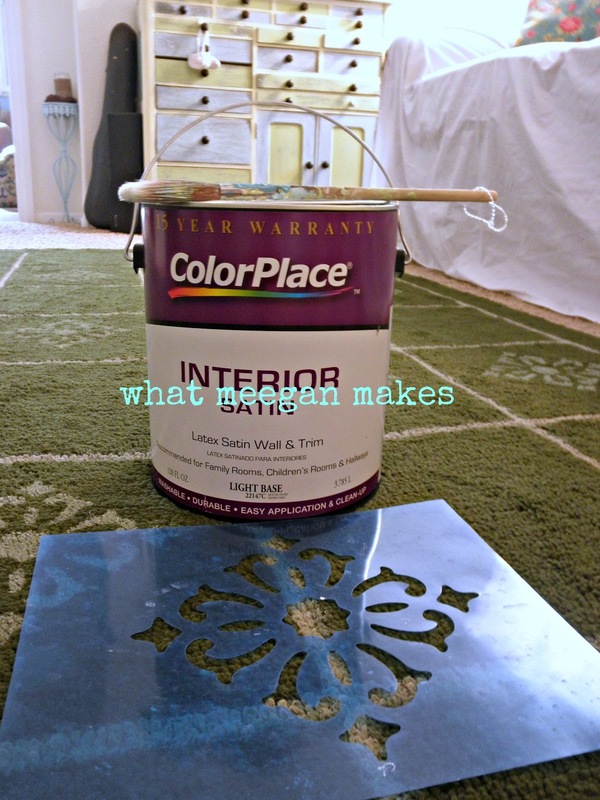 I hope you have enjoyed this tutorial on how to Update Your Existing Rug with Interior Paint. Oh goodness, Meegan! Your rug is so cute. I love the stenciled pattern you used. Thanks for sharing at throwback Thursday. You are so nice Denyse! Thanks for hosting such a fun party. I love your Party!! 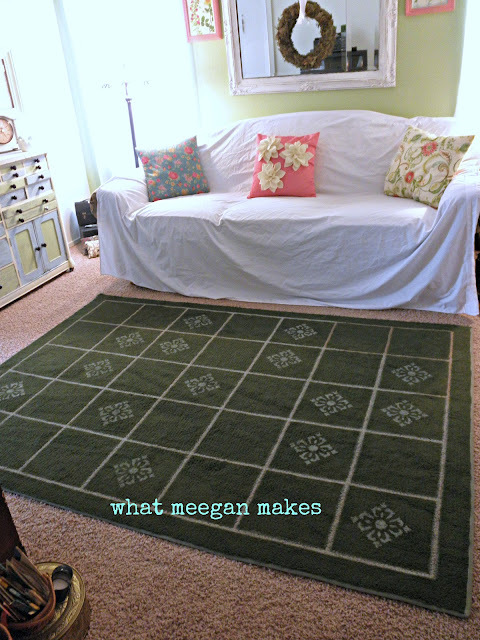 Meegan, you amaze me… seriously, I’ve never thought of stencilling a rug. It turned out perfectly and must be a great focal point for your room. Thank you for sharing this post at Shabbilicious Friday. 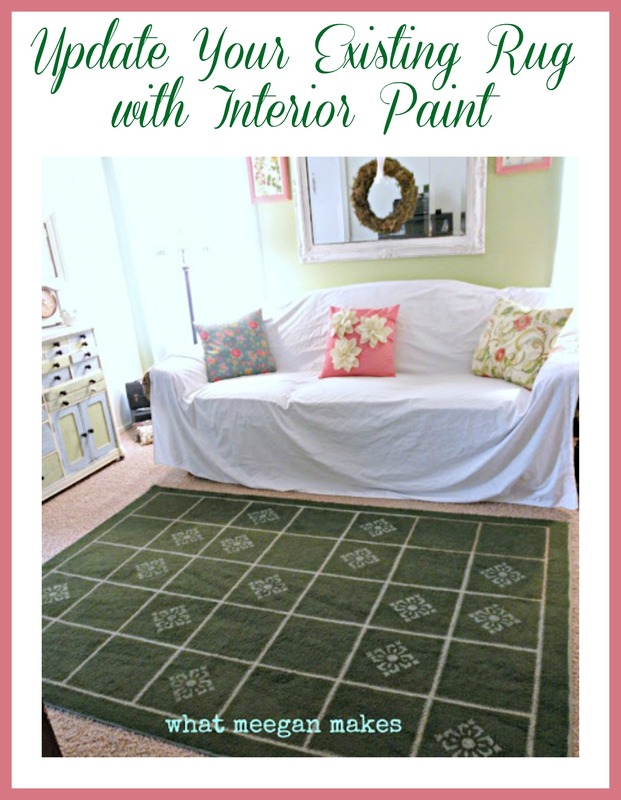 I’ve pinned it and I’m excited to feature your painted rug at the party tomorrow, so others can be inspired too.